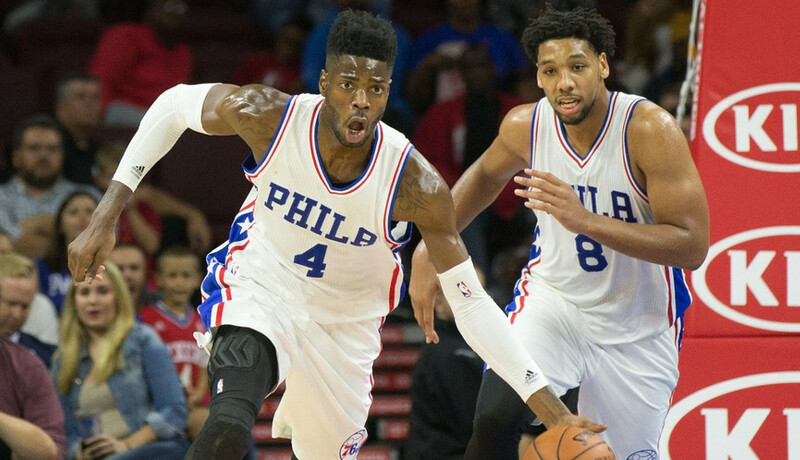 The Sixers’ rebuilding plan began with Nerlens Noel. The night Noel was drafted, former Sixers general manager Sam Hinkie traded Jrue Holiday, the most valuable asset on his overachieving, but uninspiring roster, for Noel and a draft pick that would eventually become Dario Saric. With a torn ACL and no rush to return to the court, Noel missed his entire first campaign with the Sixers. In the two and half seasons that followed, Noel was effective, with flashes of absolute brilliance. Offensively he was a work in progress, but the progress absolutely showed. His field goal percentage has increased each season, peaking at over 61 percent this year. His shot saw great improvement and Noel knocked down 48 percent of 2-point jumpers outside 16 feet this season (up from under 25 percent his first two years). On defense, he was electric. Noel showed footwork and hand speed that are unheard of in seven-footers. Noel led all NBA centers in steal rate, swiping the ball on 3.5 percent of his defensive possessions. This would be the highest such percentage for a center in NBA history, per Marc Whittington of Liberty Ballers. At 22 years old, Nerlens Noel posted defensive statistics unmatched in the long history of basketball. And then today, he was traded to the highest bidder for far less than he was worth, like an old couch on Craigslist. Noel’s tenure with the Sixers never found its footing, despite his level of play. After missing his first season, the Sixers rolled the dice on drafting another injured big man, Joel Embiid. Because Embiid missed his entire first season, Noel played the 2014-15 season with a group of cast-offs and misfits for the tanking Sixers. As his knee and body found their way back to the court, Noel did a lot of good and certainly some bad, looking like a newborn foal at times. The next season, with Embiid still sidelined, Noel was joined by another high-pedigree center, Jahlil Okafor. Sixers coach Brett Brown tried his best to manage the two centers on the floor, but it never worked. Through it all, Noel kept his head down and continued to improve. Okafor had multiple off-the court incidents involving the police and poor judgment, while Embiid reportedly fought with his training regiment and lost control of his conditioning. Nerlens Noel was a rock. Surrounded by losses, arguments, and turmoil at times, he became the face of a franchise and a team leader before his 22nd birthday. Eventually, with all three centers healthy, something had to give. Embiid is a two-way talent rarely seen in the league, posting historic numbers in his brief stints playing this season and would appear to be the Sixers franchise building block. Reports from across the league agreed that the Sixers were active in attempting to trade Okafor today as well, even after Noel was traded. Okafor’s start in the NBA has been rocky, at best. He’s been a mess on the court and off. For a 7-foot center, he does not protect the rim, defend, or rebound anywhere near as well as expected. Offensively, Okafor is uniquely skilled, but selfish and clunky. In reading those descriptions of their respective careers, it would seem obvious that Okafor was the odd man out. It is, however, contracts that are traded, not just the players who signed them. Noel will be a restricted free agent this offseason. Though the Sixers will be able to match any offer he receives, it would seem that the team was not interested in paying Noel the kind of money he’ll demand to be a back-up and insurance policy for Joel Embiid. Okafor remains under team control for two more years following this one, under a team friendly rookie scale deal. Following today’s trade, however, it would seem that the Sixers fail to realize the disconnect between what these two centers bring to the court and what they cost to do so. The gap between Noel’s play and that of Okafor is ultimately far more relevant than the gap between their pay or contract situations. The Sixers needed to move one of their centers in order to maximize the potential of those whom stayed in Philadelphia, without question. Every team and GM in the NBA knew this, removing any leverage in the trade market. Trading Jahlil Okafor, who has barely showed himself worthy of NBA minutes, without any leverage, seemed to prove impossible. No one was interested in overpaying market value for a reclamation project. Trading Noel then should, in theory, have pocketed the Sixers a palatable return, allowing the team to move on from the big man logjam. Today, the package the Sixers received from Dallas was nowhere near palatable. Andrew Bogut is already negotiating a buyout from the Sixers. Because of the protections applied, it would be laughable to call the draft asset received from Dallas anything but two second round picks. Justin Anderson is, almost like Okafor, a player with interesting tools, who has failed to really show his value in the NBA. I loved Anderson at Virginia, ranking him as a top 20 prospect in the June 2015 draft. He has the defensive tools to guard multiple positions effectively, but has yet to truly impress on that end of the floor. Offensively, his shot has turned ice cold. After making 45 percent of his threes his junior year at UVA, Anderson has managed only 29 percent from outside in the NBA. In the end, he’s an interesting piece of a team’s rotation. He does not project to be a long-time starter and potential game changer like Noel. And so Noel moves on to greener pastures. In Dallas he is perfectly cast as the Tyson Chandler for a new age. Dirk Nowitzki makes for a perfect frontcourt mate, and Harrison Barnes next to Noel on defense should be quite the show. Noel has every opportunity to develop into a star in Dallas. This was not an opportunity afforded to him in Philadelphia. Which brings us back to the rebuilding plan Noel’s acquisition started. The goal, under Sam Hinkie and in the time after Hinkie’s departure, has been to acquire franchise changing superstars, the kinds of stars that lead teams to NBA championships. Ben Simmons might be that kind of player. Joel Embiid looks like that kind of player. In the past, any player without that potential was considered expendable for the Sixers. I’ve written in the past about the unimportance of the many shifting pieces on the Sixers’ roster. The mission was driven by finding stars. With Simmons, Embiid, and a top 10 draft pick in this year’s draft in place, many Sixers fans were prepared to move to a new phase of building, finding players to the surround stars. It may be a luxury to have a player as defensively talented as Noel in a complementary role, but there is also some level of value in investing in a secondary piece. Sixers GM Bryan Colangelo seems to have defied that idea today. By trading Noel for Anderson (essentially Bogut and the picks are filler), Colangelo declared that an inferior player who does not play the same position as Embiid is more valuable to the Sixers than a superior player at the center spot. Watching the Sixers and the many likable players who have worn a Philadelphia uniform, it is easy to feel attached and to inflate the value of those players. Today was a dark reminder that the Process, for whatever it is worth, is about Embiid and Simmons and almost no one else. In the end, Noel was unlikely to be a factor for the Sixers when their rise to the contending class of the league was complete. His exit from Philadelphia was inevitable, but trading him for so little, and before Okafor, makes it harder to stomach. I’d have rather tested the market this summer to see what kind of contract he’d truly command from other teams. If the price was too steep, a sign and trade for even this paltry value would make more sense at that juncture. Now, Noel will blossom in Dallas. For Sixers fans, hope springs (as always). The treasure trove of assets that Sam Hinkie acquired in his time at the helm is so vast, it is capable of surviving some missteps from Colangelo. A bad trade leaves a terrible taste in the mouth of any fanbase. That taste can only be washed away with wins on the court, luck at the lottery, and a bright future.